Tristan Williams had just emerged from underneath a standing dog pile of Blue Springs Wildcats when the junior kicker acknowledged the game-winning field goal he nailed against Lee’s Summit was the biggest kick of his career. So, was the boot the most satisfying kick of Williams’ career? “Yes sir,” he said after his 22-yarder in overtime sent the visiting Wildcats to a 32-29 overtime win Friday on the road against its Suburban Big Six conference brethren. The win was the first of the season for the tradition-rich Wildcats (1-4 overall and 1-1 in Big Six play). Wildcats head coach Kelly Donohoe left the field feeling good about a team considered young but talented. Lee’s Summit (3-2, 1-1) had a chance to do damage during its first possession of overtime but was stopped short of the goal line on a fourth-and-1 play. Tigers head coach Eric Thomas said he believed the team needed a touchdown more so than a field goal to secure its first win against Blue Springs since 1995. That quest will have to wait for now. Both teams waited out an hour and fifteen minute-long weather delay before getting down to business. The teams put on a dizzying array of offensive exploits in their conference opener. Blue Springs scored the game's first points on a safety, then followed with a scoring run that resulted in an 8-0 lead halfway through the first quarter. Lee's Summit answered when a 70-yard drive ended with a 1-yard run from quarterback Dalton Hill with less than 2 minutes remaining in the first. Two minutes deep into the second quarter Blue Springs lined up to go for it on fourth down and drew the Tiger defense offside resulting in a first and 10 from the Lee’s Summit 45-yard line. Exactly four plays later Blue Springs faced a fourth and 1 from the 36 when Jaylen Ivey picked up a one yard gain with 8:45 to go before halftime. The gambles paid off after the Wildcats' finished an 18-play drive with a 10-yard scoring run from Tresten Spruell that made the score 14-7 at the 5:37 mark of the second quarter. 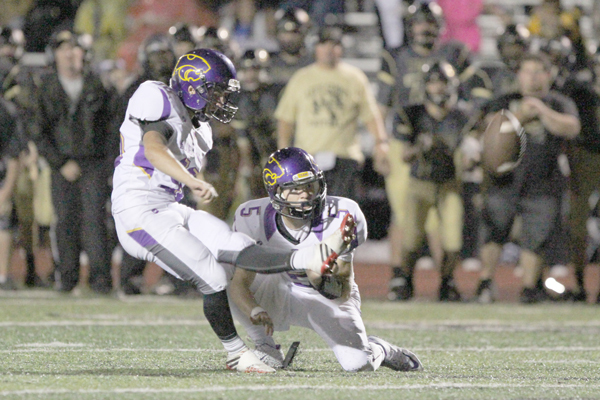 A successful extra point kick put Blue Springs ahead by eight points. Lee's Summit started the subsequent drive from their own 20-yard line and promptly moved into Blue Springs territory thanks to tough sledding from junior running back Salvatore Garozzo. Time and time again on the drive Garozzo was effective running between the tackles and down the middle of the Blue Springs' defense. Hill got in on the act as well, using his legs to help put Lee's Summit in a first and 10 situation from the 18-yard line with 3 minutes to go before halftime. A 14-yard pass reception from Hill to slot receiver Sam Buckner gave the Tigers a first and goal from the 4-yard line with 2:31 left. Two plays later, Hill ran tough for a 4-yard touchdown to help Lee's Summit pull within a point of their adversaries with 1:47 showing on the clock. Blue Springs threatened with its two-minute offense, eventually moving into Lee's Summit territory before a holding penalty negated a 35-yard scramble by Wildcats quarterback Dylan Cowling that sent the visitors into the break with a one-point lead. Lee’s Summit Zach Mitchell returned the opening kickoff of the second half 56 yards to give the Tigers a first and 10 from Blue Springs' 43. The quick moving Tiger offense used two first downs to set up a first and 10 from the 13. Two plays later Buckner took a jet sweep around left end into the end zone for a 10-yard scoring run. A successful extra point gave the Tigers a 21-15 lead, its first of the game. Blue Springs followed with a methodical drive featuring a run-heavy approach. The strategy paid dividends when Spruell ran off tackle for a 6-yard touchdown that tied the game at 21-all with 5:40 left in the third. The successful extra point kick put Blue Springs back ahead 22-21. The Wildcat defense stiffened and forced a punt that gave them possession at midfield. After two plays went for negative yards, the Cats faced a third and 17, but Lee's Summit was called for a pass interference penalty that made it third and 2 from the Tigers’ 42. Cowling then found Spruell for a 15-yard reception that was more of a prayer than a well-executed play. It set up a Blue Springs first and 10 from the 27 with less than 3 minutes remaining in the third quarter. On a third and 1 from the 18, the Wildcats’ Ivey got enough yardage for a fresh set of downs. The Wildcats used five plays to find the end zone again, this time on a Ivey four-yard run to push the lead to 28-21. The extra point made the score 29-21 with 17.4 left in the third. No sweat for Hill and company as the junior signal caller lead the Tigers to a first and 10 from the Wildcats' 22-yard line. On third and 8 with 9:50 to go, Hill took off on a draw play and weaved his way to a 20-yard score. A successful two-point conversion pass from Hill to Mitchell tied the score at 29. Blue Springs took over at its 25-yard line, and again marched down the field with its offensive line, Spruell, and Ivey paving the way. However, on a third and 10 from the Lee's Summit 47, Mitchell was credited with a pass breakup that forced the Wildcats' first punt of the game with 6:44 remaining. Shortly thereafter, the Blues Springs defense forced only its second punt of the game with 5:18 left. The Wildcats faced a third and 10 from the 44 with 2:43 to go when they called a timeout. On fourth and 1 from the 35 with 2 minutes to go the Wildcats came up short on a rushing attempt. A dead ball personal foul forced Lee's Summit to its own 19 with 1:54 to go. A holding penalty made it almost impossible for the Tigers to pull off some late-game magic. The Cats then forced another punt and took over at their own 17-yard line. Blue Springs made a series of safe plays and headed to overtime. In overtime, Blue Springs won the toss, elected to go on defense first, then promptly watched as the Lee's Summit offense marched 23 yards looking for the first score in the extra period. A first and goal from the 2 ended on fourth down from the 1-yard line when Hill was stuffed short of the goal line. Blue Springs offense countered its defense's effort with a seven-play drive that ended with Williams’ game winner.